Despite living in a world where we are one click away from getting practically any answer along with examples to solving almost any problem, why is it that most people who start a business fail? Most people who start a business are entrepreneurs who risk capital for profit. The cold truth is, most people who start a business are Technicians. The assumption is, if you understand the technical work of a business, you understand a business that does that technical work. This is far from the truth. In light of this, most businesses are people dependent rather than systems dependent. What is a system dependent business? It's basically a business that relies on people with minimum skills to operate the systems and procedures at a high level. As a result, the business won't die just relying on one person. The Entrepreneur: The visionary who thinks and plans ahead for the future. The Manager: Establishes order within the work environment. The goal is to create consistency. The Technician: The person who carries our and does the technical work. Most business owners were technicians. They excelled at their previous job and often want to pursue their own business. From above, you can see the clear distinction between the roles that must be played within a business. One isn't necessarily better than the other. They all have their advantages and disadvantages. The key is to have all three in equal amounts for a business to be successful. If you're the technician, you need the necessary skills to cut cost. If you're the manager, you need to effectively train and manage other employees. If you're the entrepreneur, you need to have the fortitude to know when to take a company in a certain direction, risks. If you're running a business, you can't remain a technician. You also can't hire people to build the business for you and cross your fingers, hoping they get it right. The key is to focus on what you want the business to eventually become, using Systems. You definitely don't want to be doing everything as your business grows. Granted, you may have to be the designer, marketer, sales person, manager, book keeper and developer at the start. But as your business grows, you need to find the right people for the right job. Only then, will you see the success you want. 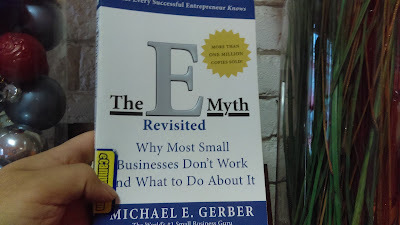 If you want more info from The World's #1 Small Business Guru Michael E. Gerber, make sure to grab The E-Myth Revisited. Voted #1 business book by Inc. 500 CEOs.